Lambert, Maude-Emmanuelle. "The Québec Winter Carnival ". The Canadian Encyclopedia, 08 February 2018, Historica Canada. https://www.thecanadianencyclopedia.ca/en/article/le-carnaval-de-quebec-fete-ses-60-ans. Accessed 24 April 2019. 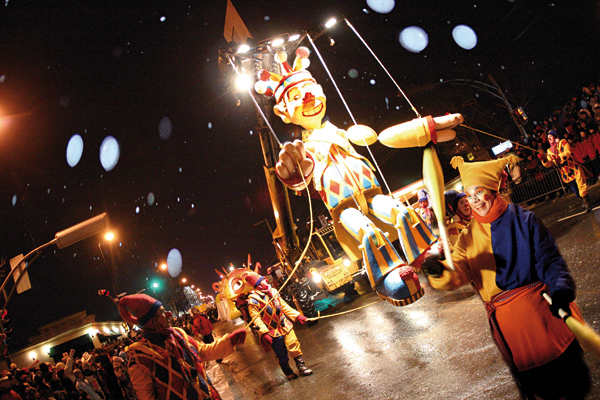 The Québec Winter Carnival is the oldest of the winter festivals that are held each year in Canada. The popular tradition of a celebration in the dead of winter can be traced back to New France. Image: Jacques Boissinot/The Canadian Press. 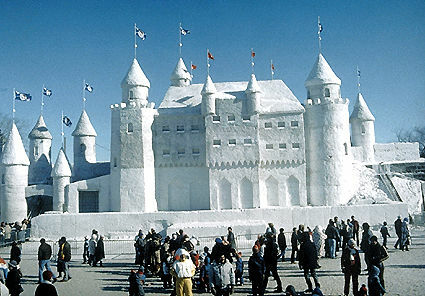 Snow palace (1988) at the Québec Winter Carnival (courtesy Carnaval de Québec Inc). 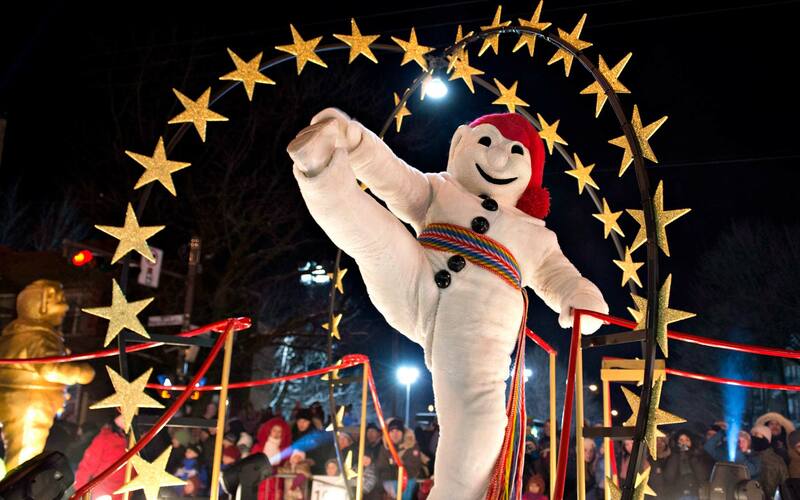 The Québec Winter Carnival is the oldest of the winter festivals that are held each year in Canada. The popular tradition of a celebration in the dead of winter can be traced back to New France. To relieve the tedium of winter, the habitantswould gather and celebrate before Lent (see Religious Festivals), from the end of January to mid-February. The first organized winter festival in Québec City, held in 1894, was the brainchild of Frank Carrel, owner of the Québec Daily Telegraph. The event was held during subsequent winters, but two World Wars and the Great Depression prevented it from being held on a regular basis. 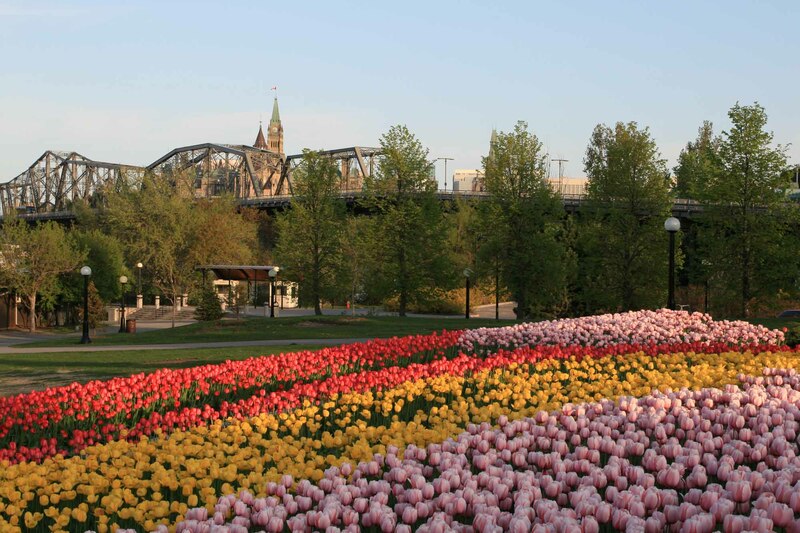 The event was reinstated in 1954 as part of efforts to revive the economy of the provincial capital, and it has been held every winter since then. The 60th official edition of the Québec Winter Carnival was held in 2014. To mark the occasion, the organizers decided to bring back an old tradition. After more than 18 years of absence and amid some controversy, the Carnival duchesses returned. Each year from 1955 to 1996, seven young women were chosen to represent the seven districts of the Québec region, called duchies by Carnival organizers. Duchesses, who had to be unmarried, were selected on the basis of their physical attributes. They were required to take courses in diction and etiquette and to attend numerous fitting sessions. One of the duchesses was chosen as Carnival Queen by random draw following the sale of candles in each of the city’s neighbourhoods (the sale of Carnival candles is a fundraising campaign that benefits many charitable organizations and community groups). The Carnival Ball and the crowning of the Carnival Queen were the highlights of the celebration. During the two-week festivities, duchesses would participate in various public activities, give television and radio interviews and do charitable work. For some of these women, being a duchess or Carnival Queen was the start of a public career. In the 1970s and 80s, however, this “personality contest” was criticized by the feminist movement (see Women’s Movement) and by some sponsors who found it sexist. In 1975, film director Robert Favreau revealed in Le soleil a pas d’chance (The Sun Was Out of Luck) that the young women were expected to demonstrate “made-to-measure” behaviour and that many hours were spent moulding them for their role. In 1982, the collective Les Folles Alliées (Fit to be Tied), which included Agnès Maltais (today a Parti Québécois member of the National Assembly), parodied the contest in their play Enfin duchesses! (Finally Duchesses!). In 1994, two men, Carl Brochu and Patrick Paquet, caused an uproar when they presented themselves as “dukes” among the 262 candidates. They were rejected after their interviews, but their attempt started a debate in the media and, in 1997, the duchesses disappeared from the Carnival program. In 42 years, more than 12,000 young women had applied to the contest. These two aspiring “dukes” later made the jump to politics. Carl Brochu was a candidate for the Action Démocratique du Québec in the riding of Chutes-de-la-Chaudière. Patrick Paquet was elected as a Québec municipal councillor and represented the district of Neufchâtel until 2012. Since then, the idea of bringing back the duchesses has come up occasionally. In 2010, a survey sponsored by Radio-Canada showed that 82 per cent of Québec’s citizens supported their return but wanted the contest format to be updated. However, since the 2000s, the Carnival has become family-oriented, and for many people a personality contest is not consistent with this approach. From 2010 on, a group of feminists expressed its opposition to the reinstatement of the duchesses by creating, on the fringes of the official Carnival activities, La Revengeance des Duchesses (Revenge of the Duchesses). Instead of worrying about their looks, these women introduced visitors to neighbourhoods in Québec using social media. More unusual was the fact that men were permitted to be duchesses. The contest was also open to women of any age. Combining tradition and renewal, the 2014 edition of the Québec Winter Carnival duchess contest was an entrepreneurial competition. Aspiring duchesses from 19 to 35 years of age (mothers, expectant mothers, students and professionals) submitted proposals for projects related to the Carnival. The purpose of the projects was to sell the most Carnival candles. The projects were carried out in January 2014 and were used to help choose the Carnival duchesses. Despite objections, it seems that the Carnival duchesses are here to stay. But for many observers, the contest is a throwback to discrimination based on age and gender. Men, as well as women who are more than 35 years old, are not able to enter the contest, for the simple reason that those groups were not allowed to participate 60 years ago. Let us hope that this “tradition” will be pushed aside and that a staunchly inclusive approach will be proposed for future carnivals. Jean Provencher, Le Carnaval de Québec. 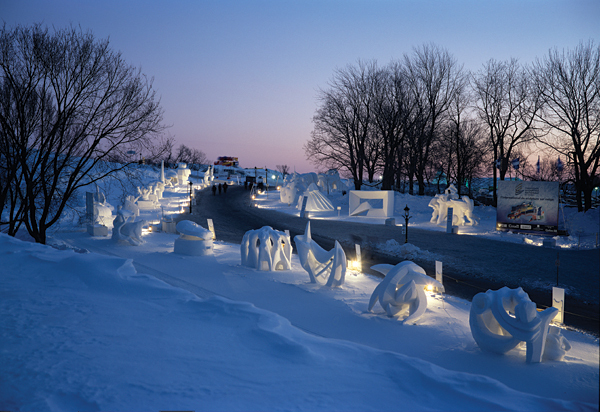 La grande fête de l’hiver (2003). Luc Nicole-Labrie, “Le premier carnaval « moderne » de Québec, 1955”, on Histoire engagée, 9 February 2011. 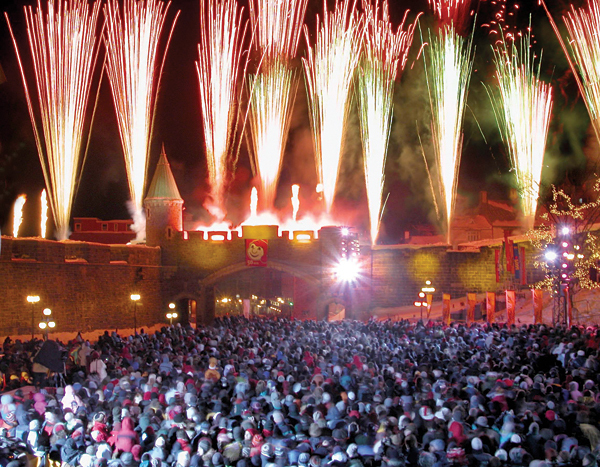 Official website of the Québec Winter CarnivalLearn more about the history of the biggest winter carnival in the world! "Le Carnaval de Québec de 1894"A description of the first winter carnival in Québec, taken from Monde illustré. Le Carnaval de Québec, Jean Palardy, National Film Board of Canada, 1956This documentary takes us into the snowy streets of Québec during its famous winter carnival. 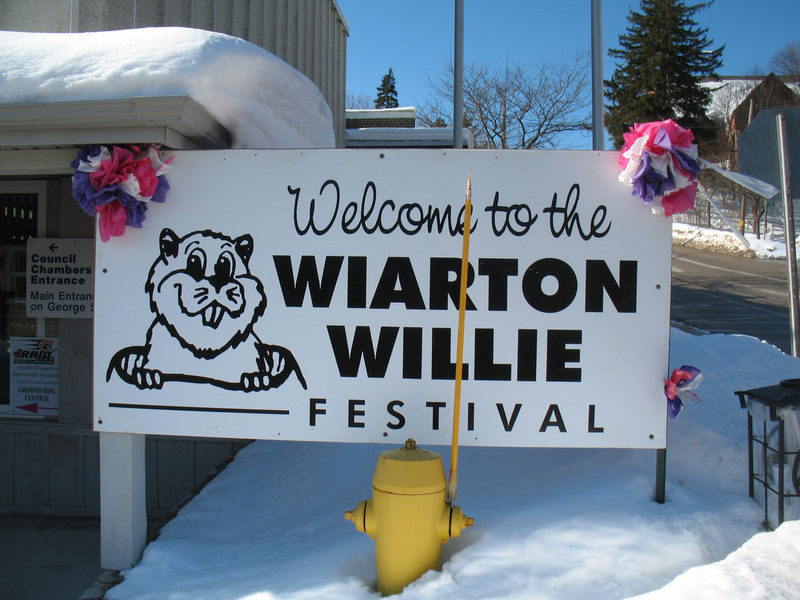 Ice sculptures, balls and parties, sporting events, dog sled races, skiing competitions and an ice canoe race across the St. Lawrence River. Carnaval de Québec, fête de l’hiverOn Radio-Canada’s website, consult this multimedia file of items from the archives. Les duchesses du Carnaval de QuébecView a short video on the crowning of the first queen of the Québec Winter Carnival in 1955. Le soleil a pas d’chance (The Sun Was Out of Luck), Robert Favreau, National Film Board of Canada, 1975In this documentary, Robert Favreau denounces the duchess contest and the Carnival’s use of the young duchesses for marketing purposes.